Chinese New Year is the biggest and most lavish holiday event in the Chinese calendar. Families gather at home, at shopping malls, and at temples to celebrate. 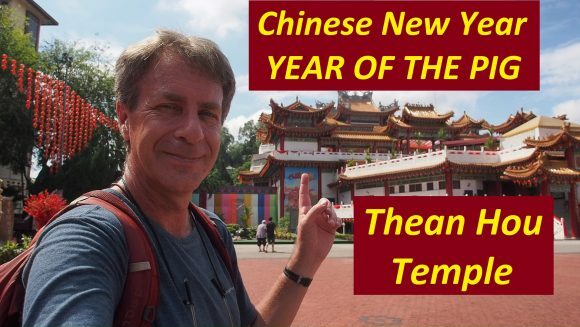 As a backpacker slash tourist, I chose to visit the inspiring Thean Hou Temple in Kuala Lumpur to begin my exploration of the traditions of this important festival. The six-tiered Thean Hou Temple is dedicated to the goddess Matzu and is one of the largest temples in Southeast Asia. Adorned with hundreds of red lanterns to scare away the monster Nian, this Temple of the Goddess of Heaven becomes the center of Chinese New Year festivities for many Malaysians. It also offers spectacular views of Kuala Lumpur and its skyline. I made my way there on foot from the Bangsar LRT station, and I pondered some of the CNY traditions along the way, including some thoughts on the mysteries of calendars around the world and the twelve animals of the Chinese zodiac. As impressive as the grandiose temple was during the day, I decided to return at night when all the lights and lanterns blazed brightly. This video is the first part of my trip to Thean Hou. In the second video, I explore the temple and the temple grounds in depth and then return at night to see the temple with all the lights. I hope you enjoy it. Turtle-Warp Speed on the KL Monorail – EXPERIENCE KUALA LUMPUR FROM ABOVE!